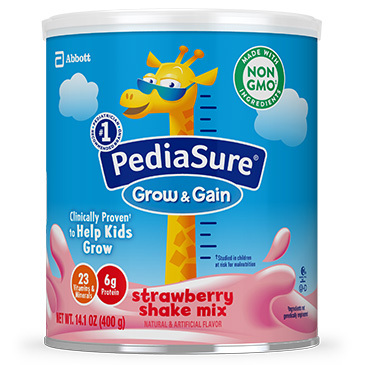 PediaSure® Grow & Gain Shake Mix. For supplement use only; not intended for sole-source nutrition. * When 1/3 cup powder is mixed with ¾ cup water. † Ingredients not genetically engineered. ‡ Not for children with galactosemia. § Natural and artificial flavors. Serv. Size 1/3 cup powder (49g) mixed with 3/4 cup water. Corn Syrup, Sugar, Blend of Vegetable Oils (Canola, High Oleic Sunflower, Sunflower), Milk Protein Concentrate, Corn Maltodextrin, Soy Protein Isolate, Short-Chain Fructooligosaccharides. Less than 2% of: Medium Chain Triglycerides, Soy Lecithin, Potassium Citrate, Sodium Citrate, Potassium Phosphate, Artificial Flavor, Calcium Phosphate, Potassium Chloride, Magnesium Chloride, Calcium Carbonate, Salt, Magnesium Phosphate, Choline Chloride, Ascorbyl Palmitate, Taurine, Ascorbic Acid, Inositol, C. Cohnii Oil, Potassium Hydroxide, Ferrous Sulfate, L-Carnitine Tartrate, Lactobacillus Acidophilus, Mixed Tocopherols, Zinc Sulfate, dl-Alpha-Tocopheryl Acetate, Niacinamide, Calcium Pantothenate, Thiamine Hydrochloride, Manganese Sulfate, Pyridoxine Hydrochloride, Riboflavin, Copper Sulfate, Vitamin A Palmitate, Folic Acid, Potassium Iodide, Chromium Chloride, Sodium Selenite, Phylloquinone, Sodium Molybdate, Biotin, Vitamin D3, and Vitamin B12. Corn Syrup, Sugar, Blend of Vegetable Oils (Canola, High Oleic Sunflower, Sunflower), Milk Protein Concentrate, Corn Maltodextrin, Soy Protein Isolate, Short-Chain Fructooligosaccharides. Less than 2% of: Natural & Artificial Flavor, Medium Chain Triglycerides, Soy Lecithin, Potassium Citrate, Sodium Citrate, Potassium Phosphate, Calcium Phosphate, Beet Powder Color, Potassium Chloride, Magnesium Chloride, Calcium Carbonate, Salt, Choline Chloride, Magnesium Phosphate, Ascorbyl Palmitate, Taurine, Ascorbic Acid, Inositol, C. Cohnii Oil, Potassium Hydroxide, Ferrous Sulfate, L-Carnitine Tartrate, Lactobacillus Acidophilus, Mixed Tocopherols, Zinc Sulfate, dl-Alpha-Tocopheryl Acetate, Niacinamide, Calcium Pantothenate, Thiamine Hydrochloride, Manganese Sulfate, Pyridoxine Hydrochloride, Riboflavin, Copper Sulfate, Vitamin A Palmitate, Folic Acid, Potassium Iodide, Chromium Chloride, Sodium Selenite, Phylloquinone, Sodium Molybdate, Biotin, Vitamin D3, and Vitamin B12. PediaSure Shake Mix is rated 3.0 out of 5 by 46. Rated 1 out of 5 by Hetal from Bring back the old formula mix I am agreed with other reviews from pediasure customers who wish to bring back the vanila mix pediasure which we used to mix with milk. my son used to be great fan of pediasure but ever since formula changed over the year he stopped drinking. he doesnt like pediasure with water . i throwed all new pediasure formula in garbage today. really hope some actions being taken and old one come back as popular demand. i even called customer service last year they said they will give message to higher department. Rated 5 out of 5 by Tisapinella from Great product Our newest kiddo is failure to thrive. Pediasure 2x day is helping her gain weight while learning what healthy foods are. In six weeks, she has gained 2 pounds. That may not sound like much, but it has made a huge difference for her! Rated 1 out of 5 by Nurse123 from She loves it but horrible ingredients! I thought this product was great until I read the ingredients. Water, Maltodextrin, sugar were the top 3 ingredients. Artificial flavors. Seriously? Please make a product without horrible highly processed ingredients. 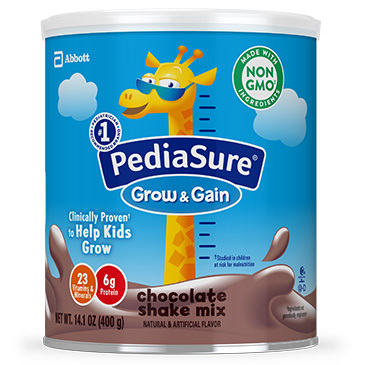 If protein shakes designed for adults can use clean ingredients surely this company can create a clean drink for children. 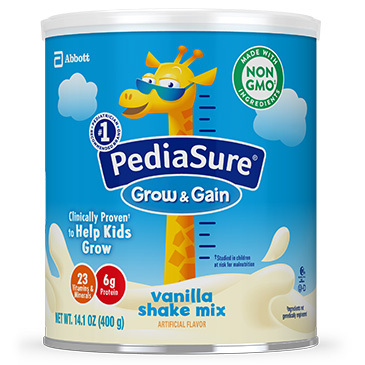 Rated 5 out of 5 by Lina34 from Great product My daughter loves the vanilla flavor mixed with whole milk. Please improve directions (# of scoops per OUNCES of liquid!!! # of scoops per cups of liquid is VERY confusing). Rated 1 out of 5 by Nick1223 from Stop confusing people with the serving size Stop confusing people with the serving size 1/3 cup powder (49g) mixed with 3/4 cup water. Really?? Can't you guys just say, 2 scoops for 8 oz?? Rated 3 out of 5 by Sans from Mix is not good and not digestible for baby Hi..pls let me know whether powder should be mixed with hot or cold water. The powder format is not good.eventhough dissolves in water but my baby is unable to digest it easily.plase bring back the powder which can be mixed with milk. Rated 1 out of 5 by Anonymous from Awful Please bring back the old one which mix in milk.My son doesn't like the new product.